你好。我照你的指示root 機,但superuser 內沒有顯示我的apps, 只顯示”No apps in list ” 及我找不到你所提及的Root Explore 那我算不算root 機不成功? 其他都不用刷 重開機後再關機 然後插入解三鍵消除驚嘆號就可以了對嗎?! 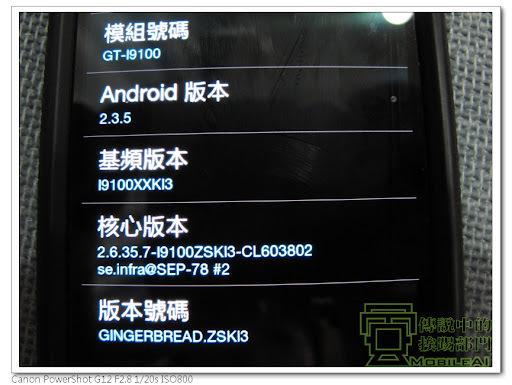 請問一下版大 這樣子刷入•GT-I9100_OLD_BOOTLOADER.tar cwm還會再嗎? 好。我照你的指示root 機,但superuser 內沒有顯示我的apps, 只顯示”No apps in list ” 及我找不到你所提及的Root Explore 那我算不算root 機不成功? Device is NOT connected! Please connect the USB cable and try again! 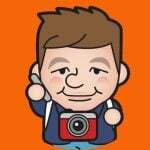 請問一下 為何我要刷回原廠KI3都刷不回去 一直出現FAIL 我也遇到這個問題耶 怎麼辦? 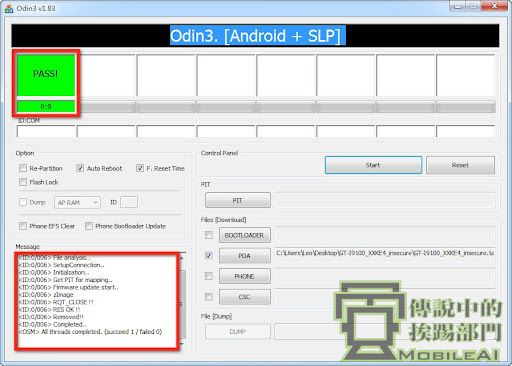 我又再試了一次要 "替換 BOOTLOADER 版本" 但還是不成功，最後想說乾脆來wipe好了(因為爬到版主那篇雙wipe的文)，可是我進不去Android System Recovery的畫面!! 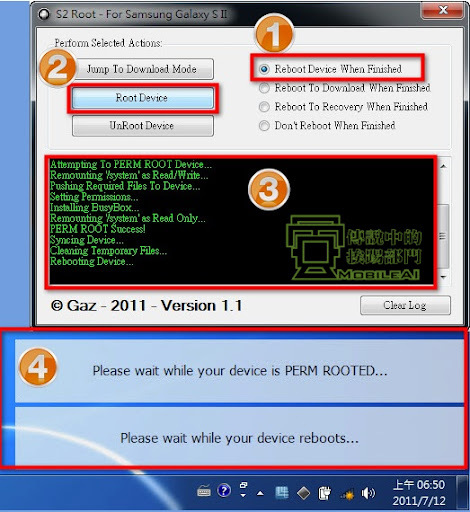 我是第一次root，結果很不幸的失敗了!!! 我在第一個步驟 “替換 BOOTLOADER 版本”就失敗了!! 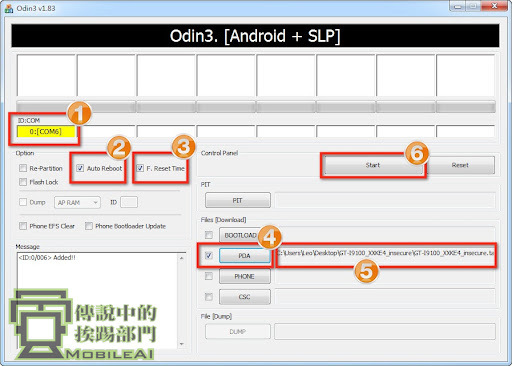 我又再試了一次要 "替換 BOOTLOADER 版本" 但還是不成功，最後想說乾脆來wipe好了(因為爬到版主那篇雙wipe的文)，可是我進不去Android System Recovery的畫面!! 現在我也不知道該怎麼辦?? 可以請問版大我的s2還有救嗎?? 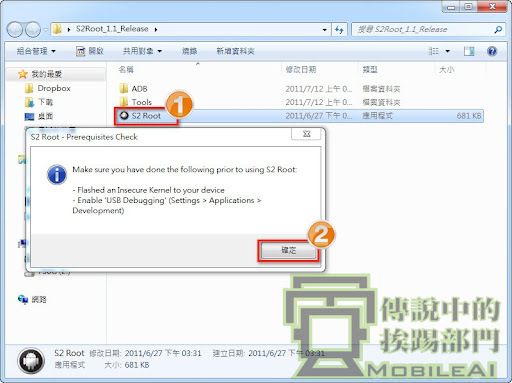 因為一開始我先使用Easy Rooting Toolkit Leo2016 V2 root兩次才成功,也有SUPERUSER,後來我又在unroot也成功,之後要在重裝的時候就一直失敗裝不進去了! You may not flasg a Secure Stock Kernel back to your device if you wisg to so so to remove the Yellow Triangle and device startup. 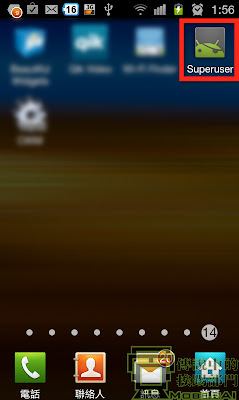 出現"Device is not connected ! Please connecet the USB cable and try again"的訊息，怎會這樣子呢@@? 受不了…一直失敗 為什麼… 跟樓上一樣 Device is not connected ! 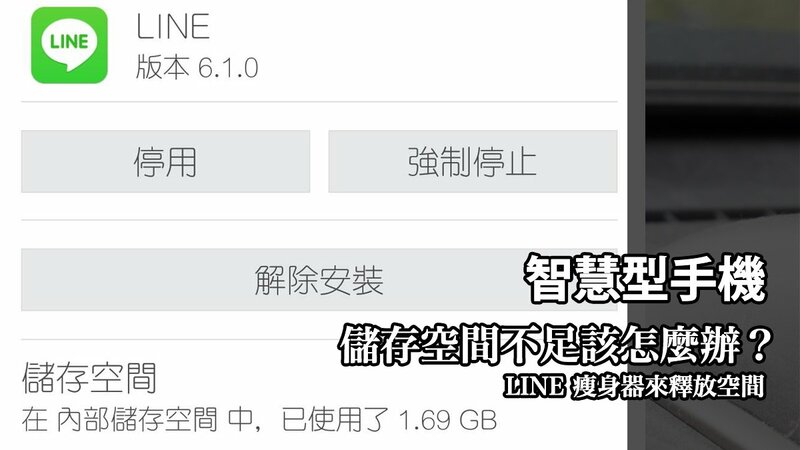 Please connecet the USB cable and try again 我線插後面我也 NET 4.0 USB除錯也開了 還是一樣…………. 版本都對 KIES也安裝了 前面步驟也都OK有自動從開機 請問會有什麼原因導致這樣的? 會是因為沒有安裝Microsoft .NET Framework 4嗎?這個軟體主要是什麼功能呢? 最後一個步驟都會出現一個視窗寫著You may not flasg a Secure Stock Kernel back to your device if you wisg to so so to remove the Yellow Triangle and device startup.